So, Christmas is over for another year and my MS hands are feeling the strain! Last year my son got an ear full when he knocked my (festive) glass of wine all over the finished card mountain! Unable to face doing the job again I retrieved the soggy, wine drenched cards, dried them out on the radiator and sent them anyway! No one seemed to notice! Then there’s the wrapping frenzy that starts around the 15th and usually goes on till late on Christmas Eve. I used to take pride in my presents, finishing them off with curled up, silver string and writing little cards. Now it’s a mission to stand up for long enough while I cut the enormous roll of paper! I end up with jagged edges and paper too big for the present. Cellotape is another challenge, finding the end requires fingers that work! The end result looks a mess but my kids take approximately 1.5 second to unwrap them so I’m not going to lose much sleep over it! Then there’s unwrapping which also requires a certain amount of dexterity in the digits. I spent ages on Christmas day fiddling with little plastic clips that hold toys in a vice like grip, presumably to deter shop lifters. Trying to get the thick, brown tape off the box that housed my new lap top took much huffing and swearing too but I got there in the end! After all this I feel like sending my hands on a spa break to recover but I’m pretty attached to them so a good rest at home should sort them out! Luckily my lack of mobility and balance make it impossible to do much in the way of cooking on Christmas day or I’d hate to see the results! The extent of my cooking was hacking up a couple of cauliflowers to make cauliflower cheese! We had a great few days and I’m now resting amid the carnage! 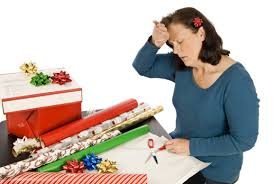 What little Christmas jobs do other MSers find difficult? ← Work related scooter carnage!